“Dad, can I have $5.00?” Sure kiddo, here you go, have fun with your friends. The preferred result getting $5.00 right away, makes the behavior more likely to reoccur. Next time Bobbie will most likely just ask Dad. Assume that the “Dad” figure is the main person to take dog for walks. This usually happens after work and changing clothes. Dad set the original rules/habit of life for this after work time. Dog is bonded to the habit of walking with dad after he arrives home. Dog analysis – Dad and I, we check stuff out together. When he comes home he pets me, goes into that other room, then he comes out picks up leash and baggies and we go outside for “use your nose time” I get to wander about, smell awesome stuff and tell the other local guys I am still here, healthy and all is well. Dad is working later than usual, and is extremely tired when he gets home from work. He thinks, I will walk the dog in a little bit. Instead of going right out, dad has a beer, then sits on the chair and puts his feet up. Dog follows dad, Dog begins to bark at dad when the behavior pattern is disrupted. He barks at him and walks to the door. No response, He then returns and repeats this “reminder” of what we SHOULD be doing. Dads’ response can be one of a few things. Dad gets up and takes dog for walk. Dog’s Analysis is: “Dad forgot the rules of life, barking let him know it was time for walk. Dogs Take away is BARKING WORKS. Gives dog a cookie/treat instead – Dog Analysis is: “Dad seems to have forgotten the rules of life but barking made him give me food. not the reward I was looking for but hey I like treats, pretty cool, barking gets me treats. 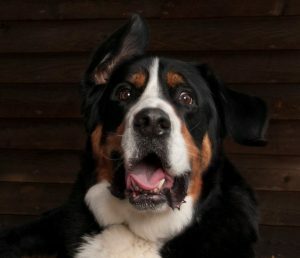 Dad ignores barking – Dog eventually gives us (depending on breed and personality, “eventually” can be 5 minutes or an hour or longer.) Dog Analysis is: – HMMM… Dad seems to have changed the rules, Dad isn’t responding, I am SO frustrated, why isn’t he getting ready to go walking? Dog’s Take away is BARKING DOESN’T WORK. Owner Take away – My dog is so stubborn. Dad realizes his dog is expecting the normal walk time. Dad asks dog to Sit, Shake Paw and Lay down. He then gets up, gets leash and takes the dog for a walk OR when dog goes to lay down on sofa Dad gets up and takes dog for a walk. change that for the future. Owner take away: Dog has given me great information about his dependence on structure in daily patterns. Training can help make this more manageable for me. For some dogs the level of frustration when dad simply ignores it can be VERY aversive and some dogs will simply just not stop if barking has been reinforced regularly. For some dogs, once is enough to make them change their understanding of the purpose barking serves. For them, barking now means cookie or barking means I go for a walk. For other dogs the pattern needs to be repeated a few times before they key in to the new rule that has been established. If instead we redirect and give dog an alternative job, we have shown the dog that there are several ways to get what you need/desire met but barking is not one of them. We also have a new training to work on based on what our dog has shown us. Dogs will repeat behaviors that provide them with the consequences (results) that they want. Be sure you are communicating clearly to your dog the polite ways to ask for what they need and your dog will use these behaviors first and foremost.